I wrapped up a busy year of traveling with a feather in my cap- scuba diving in the Maldives with The Hydrous organization. Sly Lee, The Hydrous founder, had been to the Maldives before in early 2015 to establish a baseline of coral reef health, and our return trip was the first time we would use 3D technology to assess coral growth over a period of time. The Maldives is one of the most at risk countries for climate change. This low-lying island nation already experiences beach erosion, coral bleaching, rising sea levels and increased weather events, such as the 2004 tsunami that devastated the country. All eyes are to the horizon as an El Nino is predicted to arrive in the Maldives in April of 2016, bringing with it the largest coral bleaching event since the 1977/’78 El Nino, which destroyed 90% of coral cover in the island nation. The Maldives is made up over 2,000 small islands, which makes waste management a logistical nightmare. The photo above was taken in Malé, the nation’s capital and home to almost half of the country’s population. With an area just over 2 square miles, Malé is one of the most densely populated cities in the world. The Maldivian word for beach, Gon'du dho, is synonymous to “trash dump,” a mindset evident at each local beach not owned by a resort. Local organizations such as Save the Beach conduct beach cleanups, but the underlying attitude toward the environment will take longer to change. Like many island nations, the two main sources of industry in the Maldives are tourism and fishing. Seafood is a staple in the Maldivian diet, and yellowfin tuna are highly sought-after and fetch high prices on the export market. Although most fishermen use sustainable methods of troll and pole-and-line fishing to catch tuna, the real threat is to small baitfish populations, who are caught in bulk to supply bait for commercial tuna fishing. The removal of bait fish from coral reefs destabilizes marine ecosystems, making them more vulnerable to other stressors. The Hydrous uses 3D modeling to visualize the effects of climate change, overfishing and pollution on coral reefs. Sly and I taught our expedition members underwater photography and photogrammetry, which utilizes photography to create 3D models. Our participants were soon creating their own 3D models, including this model created by our scholarship student, Patchi. We’re working with Autodesk and other software developers to build an online 3D coral model repository, which will be used worldwide to create open-access oceans, viewable to anyone with a computer or smartphone. Our most important contribution while in the Maldives was the creation a youth program, Maalimi, designed to improve education, environmental awareness and marine conservation. The program was created from collaboration between our participants and local partners, and aims to support education and marine conservation in the Maldives by creating and empowering “island ambassadors.” These ambassadors will conduct beach cleanups, lead educational snorkel trips and teach fish and coral identification workshops, in addition to working on a long-term project to improve island resiliency in the face of climate change. Visit www.maalimi.org to learn more about Maalimi and how you can help. 10 days, 20 scientific transects, hundreds of 3D coral models, thousands of fish surveyed and the creation of a youth program- a successful expedition for The Hydrous. 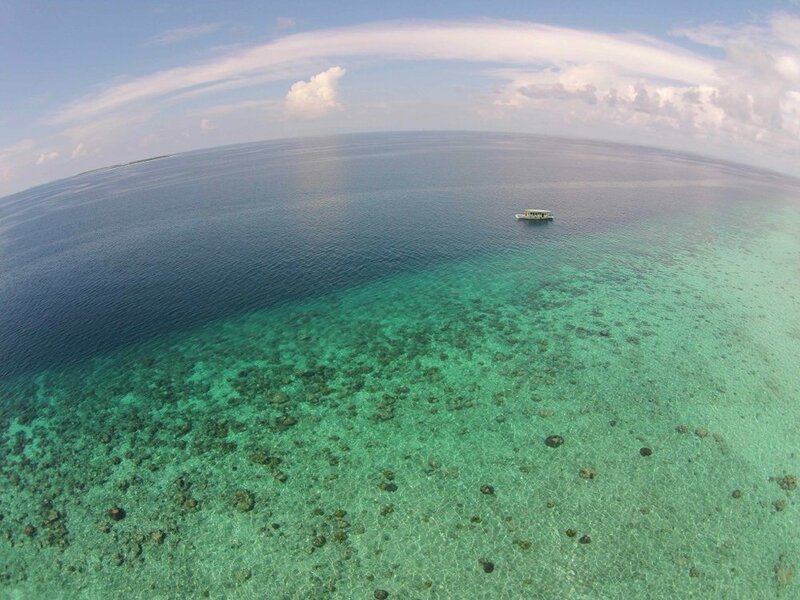 We look forward to returning in 2016 and mapping more of the Maldives’ beautiful coral reefs. Happy New Year! Six days after the Chilean Armada closed the port, the black flag was raised at the harbor, and we resumed diving operations. Finally we had the chance to dive within Hangaroa Bay, at a site called Manavai. The site was dominated by mountainous lobe coral, known to scientists as Porites rus. Some of these pinnacles extended 5 meters (15 feet) high of the ocean floor! Remnants of the storm could still be felt underwater as we were rocked back and forth by the swells, and visibility reduced to only a few meters. Another interesting site in Hangaroa Bay was a sunken Moai ( a replica, not original), down at the bottom of the ocean at 22m (75ft). It was quite surreal seeing a giant resting among the reef, becoming part of the community as corals and urchins settled on it. We finish our expedition with a dive site at Motu Nui (the island where the annual Birdman competitors used to retrieve their eggs). This was by far the most extreme site we visited- waves smashed into the shores around the island, the reef, starting around 2o ft below the surface, abruptly falls away to 100+ feet to the bottom of the ocean floor. It has been a long and eventful 19 days, and I'm glad to be heading home. Rapa Nui is beautiful because of its isolation and mystery, and sadly a classic case of an ecosystem that is almost completely stripped of its natural resources. I hope our work documenting this massive bleaching event can provide insights into coral reef conservation strategies and aid in the efforts to make Hangaroa Bay a MPA. We will be working up our data and developing 3D visualizations and models very soon for anyone to see and use! Stay tuned! On the south west corner of this island lies Orongo, a filled in crater that extends some 300 meters deep (that’s over 1,000 feet!). Ancient stone houses were carved into the side of the hillside for past peoples to escape the constant winds. In tribal times, the Birdman Competition, would be held here. The ritual was an annual competition to collect the first sooty tern (manu tara) egg of the season from the islet of Motu Nui, carefully strap the egg in a forehead basket, swim back to Rapa Nui and climb the sea cliff of Rano Kau to the clifftop village of Orongo with the egg unbroken. The monolithic Moai statues were painstakenly carved from the sides of a crater at Ranu Raraku on the eastern part of the island, and transported to the coasts all around the island. Seeing these giants buried up to their shoulders was truly awe-inspiring. As with many cultures throughout time and around the world, there once existed much tension between the villages and peoples on this island. In the midst of conflict, most of the Moai were toppled over, their red hats (archeologists still don't know the significance of these hats) sometimes rolling all the way into the ocean. In the 1950’s- 1960’s archaeologists restored Moai around the island, the pinnacle of their effort being Tongariki, a collection of 15 Moai side by side on the east coast. Some of these giants were 18 meters high, and only basic instruments were used in their resurrection- stones, trees, and rope. The shifting of the South winds to North allowed us to work at the southeast coast of Rapa Nui today. In a place this remote, where the nearest recompression chamber is across the Pacific ocean on Chile, we try to work safely as much as possible. We take our fishermen captain’s boat 45 minutes around the island to reach our site of interest. In stark contrast to the reefs at Anakena, this reef is dominated by small branching corals, Pocillopora, and an abundance of sea urchins. I’ve never seen such a dense population of urchins in my life. Like Anakena, there is a eerie lack of fish; only small damselfish and the occasional butterfly fish can be seen darting about. As the day progressed, swells picked up and James and I are thrown side to side 15ft at a time while attempting to finish our surveys. Part of Nicolas’ project includes analysis of fish stomachs for micro-plastics. The size of the fish caught on reefs is shockingly small, a prime example of what scientists have observed as “fishing down the food web”, as large/top predator fish are taken first for food; when big fish are gone, the next biggest fishes become prime targets for fishermen until only the smallest fish remain. We were successful, albeit cold and tired at the end of the day. On Sunday, February 22, 2015, former president of the Maldives, Mohamed Nasheed, was arrested on charges of terrorism related to political decisions made in office in 2012. Since his arrest, thousands of protesters in the Maldives have been flooding the streets to protest the charges, citing political motivations behind President Nasheed's resignation and subsequent arrest. Nasheed's environmental and humanitarian work and his title as the first democratically elected president made him a favorite with many Maldivians, and supporters in the United States and United Nations are calling for his release. 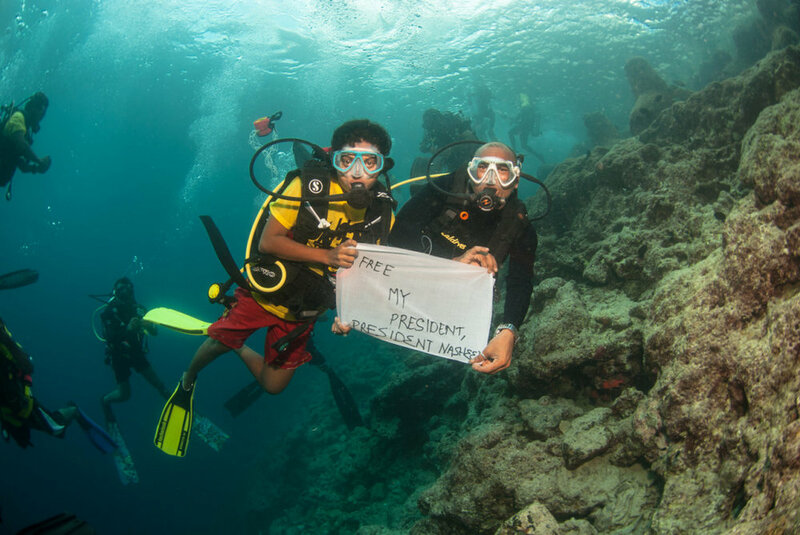 The Hydrous worked with former president Nasheed during our expedition to the Maldives in 2014, and share his goal of an environmentally-healthy Maldives. Coral reefs in the coral atoll are extremely fragile, due to factors such as pollution, over-fishing and climate change. Unfortunately efforts to correct these environmental issues often get put on hold during political unrest. This past February The Hydrous presented our work in the Maldives at the REAL 2015 conference, the world's first reality computing conference. We spoke about our collaboration with Nasheed and the broader aims of our work, which is to link humanitarian and environmental crises and work to solve both through imagery. We will be returning to the Maldives later this year to help the cause. A long flight from Hawaii to Chile to Easter Island deposited me on one of the most isolated and unique islands in the world: Easter Island, or Rapa Nui in the local dialect. Seeing the “downtown” area was a surprise to my pre-conditioned sense that Rapa Nui was a desolate, isolated island, a once thriving culture full of mystery. In fact, tourism has increased dramatically in recent years as the Chilean middle class expanded. A plethora of restaurants, two dive shops, and bars line the streets along Hangaroa Bay. Upon closer inspection, however, one can still get a sense of the isolation on this small bit of rock in the middle of the Pacific. 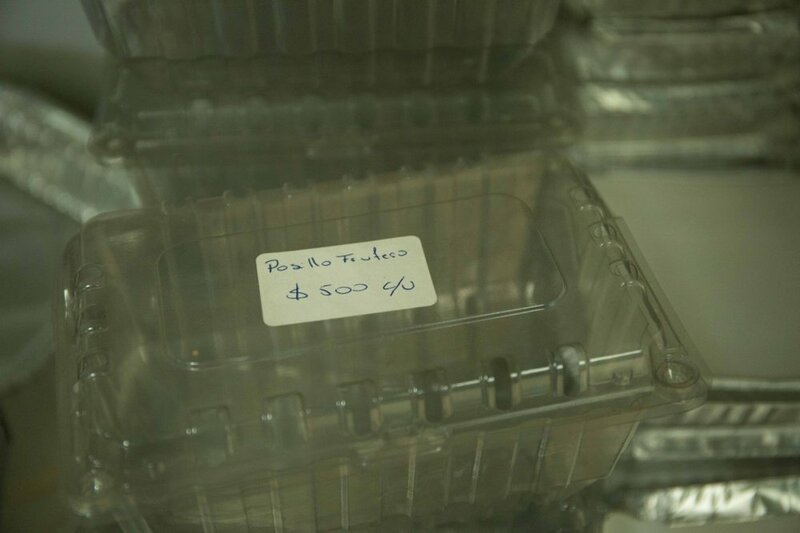 Plastic containers, such as strawberry containers, are sold in stores. Items most people normally discard with little or no regard to where they end up, in landfills for 1,000 years, are sold here for their utility. And of course the iconic Moai statues of Rapa Nui do not disappoint. More background on them later. El Niño, the natural phenomenon which creates warming of the oceans, affected many parts of the world last year and carried into this year as well. We documented coral bleaching after the El Niño in Hawaii and Maldives last year, and here in Rapa Nui, we are also seeing signs of mass coral bleaching. I’m here working with James Herlan, a Ph.D. student of the Universidad Católica del Norte in Chile. 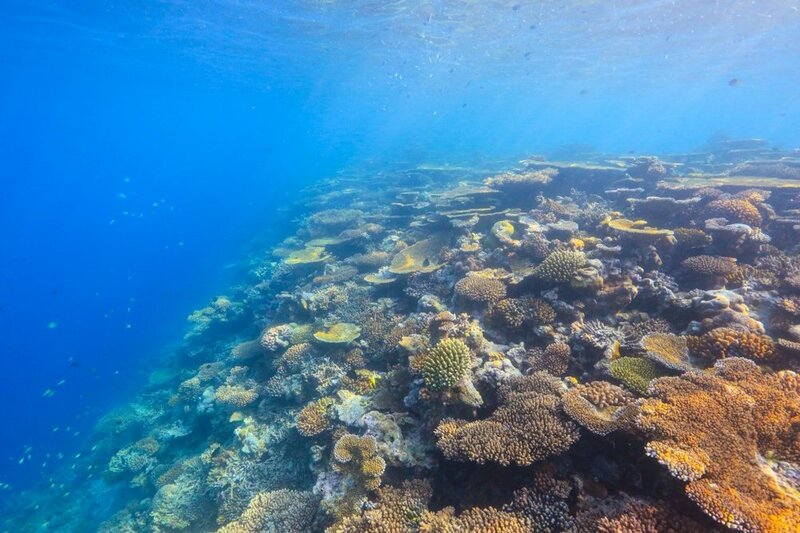 Together we are making great efforts to document this bleaching event, capturing imagery of the reefs in the form of photo mosaics that are 25m x 10m in cover, 3D modeling sections of the reef, conducting fish surveys, and gathering coral samples for microbial analyses. The data from this endeavor will go towards a massive effort to make Hangaroa Bay a Marine Protected Area (MPA). Most of the tourism is concentrated in Hangaroa, and many Chilean scientists believe a collaboration with citizen scientists would greatly benefit the health of the reefs in this area. Our first dive was on the northern shores of Rapa Nui, off Anakena beach, the only sand beach on the island. 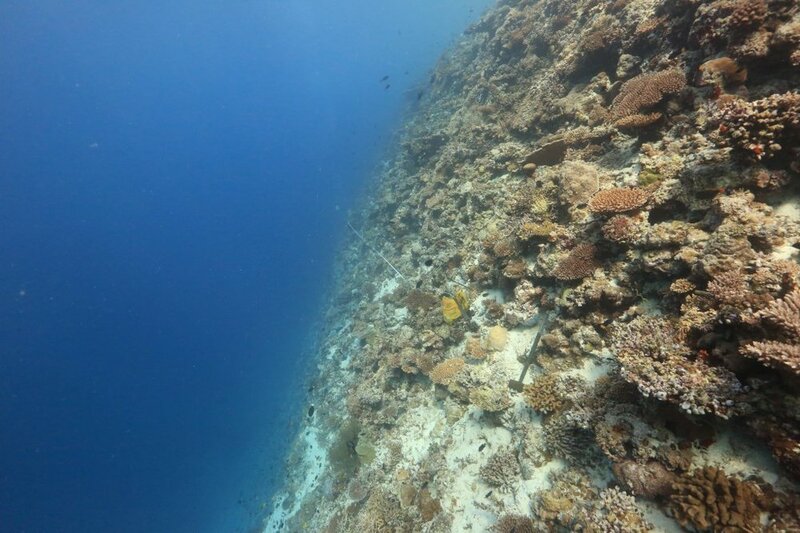 I’ve never experienced a coral reef quite like this one- incredibly high coral cover, but low coral diversity-one or two species of coral dominated the reef. One of the most immediate and disheartening signs we saw was the nearly complete lack of fish. All large predators and top herbivores were absent from this reef, only very small Kyphosis (chubs) and wrasses dotted the reef. In addition, a post-doctoral student of ESMOI is sampling the prevalence of “micro plastics” in the waters and fish around Rapa Nui. A plastic bottle in the ocean is fairly easy to retrieve, but how does one recover that plastic when the bottle disintegrates into 1,000 pieces? Usually it ends up in the guts of marine life. We have much work ahead of us as we plan to survey the southeastern shore as well as Hangaroa Bay. 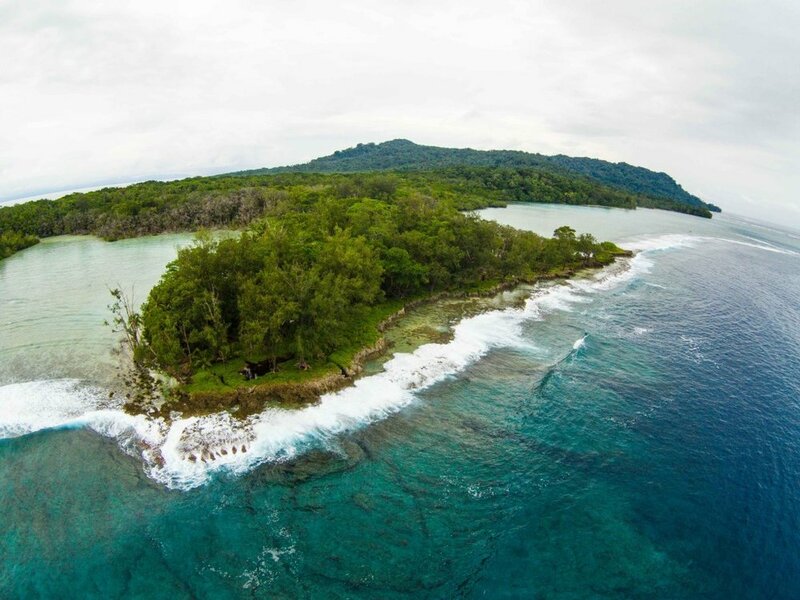 Tetepare is the largest uninhabited island in the South Pacific. It is chock full of lush rainforests, old strangler fig trees, sky-scraping coconut trees, and a myriad of flowering plants. Heated battles over land rights and usage have plagued the island since the head-hunting tribes a few hundred years ago. Today it houses an eco-lodge for visiting scientists and adventurous honeymooners, but is still a topic of heated debate. The riveting history of Tetepare is captured in the book, The Last Wild Island, and chronicles the establishment of the Tetepare Descendent's Association, and the fight to save it from international logging. 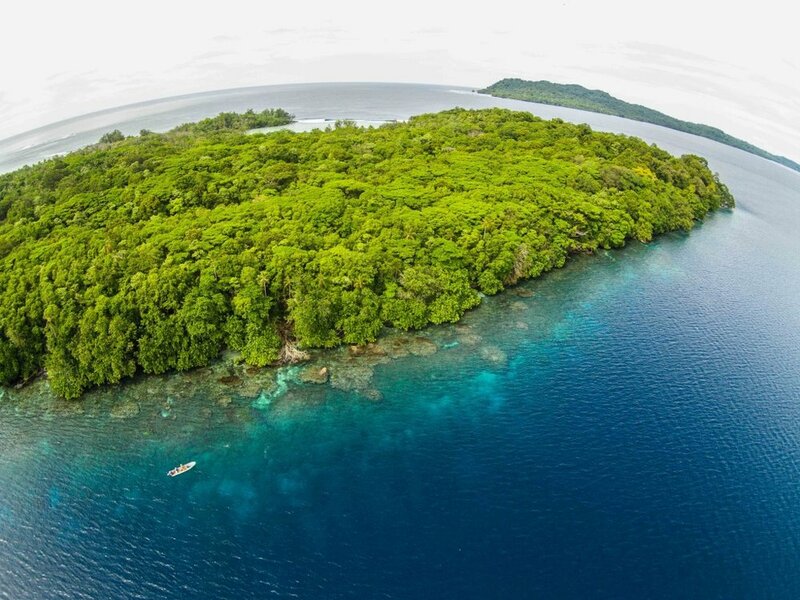 We have been trying to arrange transport to Tetepare for 2 weeks, which should seem easy given that it is only a few hours boat ride from our current island of Lola. However, boats and reliable outboard engines are scare in Munda, especially one hearty enough to haul the 16 scuba tanks and scuba gear along with us. Right at the end of our stay, we were finally able to secure arrangements to make our way to Tetepare for 2 nights, relying on our guide, Sunga, to do most of the logistical legwork. A brief 2 hour boat ride in our 16ft, 40 horsepowered boat lands us at the most beautifully lush island I've ever witnessed. After settling into our spacious leaf huts (which were built by hand without the use of nails or screws) we chatted with Toumey, our local guide and station manager. At the island's "eatery," Toumey acquainted us with the local "kastoms," dangerous plants and animals of Tetepare. We conduct our first dive on the windward shore of Tetepare amid underwater swells that rolled us back and forth as we searched for bumphead parrotfish and 3D modeled corals. Immediately we saw more bumpheads here than we had during our entire time in the water in previous weeks. After lunch we set out for a marathon snorkel. The size of the fish I saw underwater scared me because of their size. I've dived on coral reefs in a variety of locations including Hawaii, Palau, Saipan, Guam, Bahamas, Florida, and the Maldives. In those locations a snapper that is about 50cm long is considered a large one. In these protected waters surrounding Tetepare, I witnessed schools of snappers twice that size, or 1 meter and over! 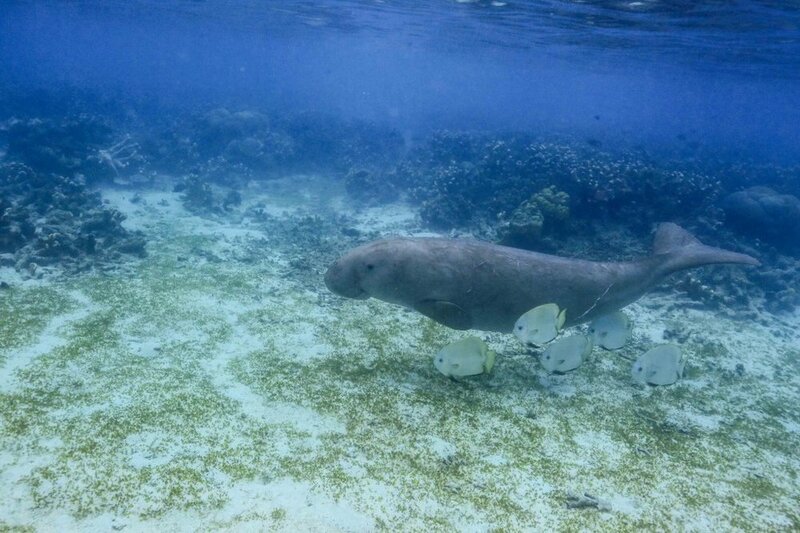 I was also graced by the presence of a dugong, which once resided in the seagrass beds of Tetepare, but are more rare since the Tsunami a few years ago. Toumey tells me it has been one year since one has been spotted in the lagoon. The next day we spent more time in the water than out, conducting 2 scuba dives and 2 snorkels on the leeward side of Tetepare, in the shallow coral gardens. These corals were undoubtedly the healthiest I've witnessed in the Solomon Islands, and also the largest. 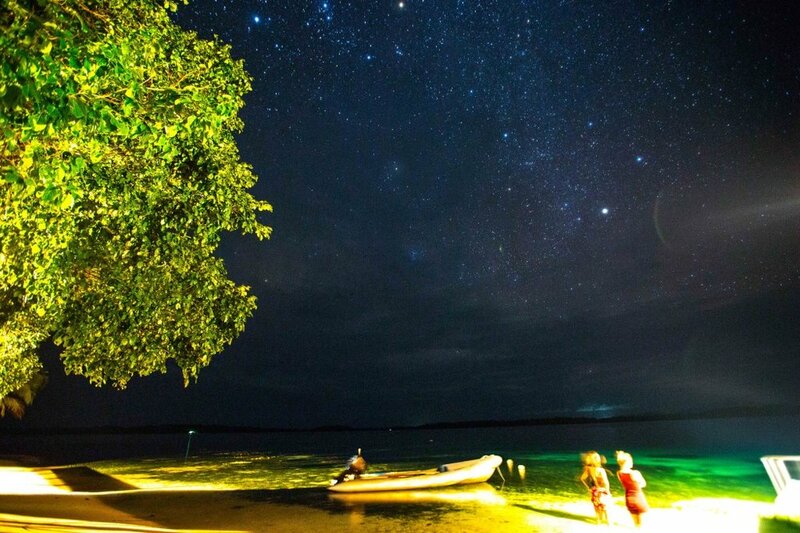 At night we soaked in the solitude, wishing we had more time on this remarkable island. Tetepare is still struggling with environmental issues, and you can help support this last wild island by visiting their website and helping via spreading the word, volunteering, or even visiting in person. All information can be found at their website. I awake at 6am to a dozen roosters on the property, a swollen lower lip from some strange bug bite, and the buzzing of a mosquito that apparently slipped past my bug net fortress. Despite the itchy morning start, I'm keen to start our scuba dives for the day in the stifling heat of the Solomon air. After assembling our scuba gear and photography equipment, Mikayla, Andrea, and I board our little speedboat to a field site. Mikayla and Andrea have already spent a month in the Solomon Islands before I arrived, so today I got my first glimpse of Solomon Island coral reefs. After conducting a bumphead parrotfish survey (in which we only saw 3), Mikayla photo-modeled a few corals in order to compare structural complexity of the reef. I also photo-modeled a few corals, and documented the local stressors in the area, noticing a multitude of crown of thorns starfish, which feed on corals. We also measured water quality parameters, documenting the pH, and levels of nitrates (which are indicators of nutrient run off, usually from waste water). After a quick lunch on a nearby beach, we launched the drone, a DJI Phantom 2+ vision quadcopter, equipped with a HD camera and electronic gimbal for smooth video capture. Donned with a hand-made flower lei, our guide, Sunga, was as thrilled as we were to see the drone soar to 100m above the ocean, and even more thrilled to catch it as it landed. The next day we visited the infamous Skull Island, the location of dozens of human skulls. Dating back 100 years ago, these skulls were trophies of the head hunting games that once took place in these islands. The memorial is littered with dead coral skeletons and shell money that was once the currency for these islanders. In coming days we will be attempting to visit Tetepare, the world's largest uninhabited island. Highlighted in the book, The Last Wild Island, this lush island gem was and still is to some degree a contentious place in the battle between pro and anti logging parties. We wrapped up our work in the Maldives with a heavy heart, but also with scientific data from 48 transects, 50 hours underwater, 212,000 photos and 1.5 terabytes of data. Our three-week expedition was the first of its kind, as we utilized a new 3D coral imaging methodology and made our first official expedition as a non-profit organization. The team bid farewell to our new family: "Grandpa" the boat owner, his son Ambade and friend Patchi. Our time with them reinforced our respect for those who depend on the ocean for their livelihood. After wrapping up our scientific work, we began the multi-day journey back to Male, the capital of the Maldives. With a population of about 100,000 people and size of 2.2 square miles, Male is one of the most densely populated areas in the world. After our arrival (following a harrowing journey by sea-plane, ferry and taxi) we met with President Nasheed, the former president of the island nation. Despite not being in power, he remains very involved with the country's social and ecological concerns, including working with international environmental organizations including Mission Blue, IUCN, UN, and other activists. President Nasheed and his team of inspiring young professionals focus their attention on the future, and how they can save their country from the rising waters of climate change. Two days after meeting with President Nasheed and his team, I presented the research and findings of three-week expedition on the heels of the Asia-Pacific Business Forum (APBF), a conference discussing sustainable business and growth among stakeholders. At the APBF, President Nasheed gave the keynote address and spoke at length of the importance of sustainability in tourism and the important role the ocean plays in the economy of the Maldives and other Pacific island nations. I presented the findings of our project to a packed room; conference attendees included the International Union for the Conservation of Nature (IUCN), scientists and local non-profit organizations and businesses. The conference was covered by all four Maldivian news channels. Our first expedition as a 501(c)(3) non-profit organization was a success; we collaborated with local scientists, decision-makers and the public, began a 3D model catalog of coral species and collected scientific data for future research. Our work in the Maldives will be featured in Wired UK this January, and in Wired US in March. We hope that the increased publicity will bring worldwide attention to the plight of island nations and their precious coral reefs. Many thanks to our collaborators at the Korallian Lab and Dr. Michael Sweet, who assisted our research. We're looking forward to a 2015 full of awareness, change and new policies to protect our ocean resources. Stay tuned for more. We will be producing a documentary of our epic journey soon! On November 23, 2014, The Hydrous began an expedition to the Maldives to implement the first real-world application of our 3D coral modeling methodology. Our project's goals are threefold: 1. Conduct a rigorous scientific experiment and gather baseline data of the reefs before the projected El Niño in early 2015. 2. Create beautiful, interactive 3D models of Maldives' coral reefs for education and outreach. 3. Foster collaborations with local resource managers, educators, and visionaries. The Maldives is an ecological last stand, a window of what may come of other island nations; located only 1.5 meters above sea level, the country is extremely vulnerable to natural disasters and rising sea level. In 2009 the president of the Maldives, Mohamed Nasheed unveiled a plan to make the island nation carbon-neutral by 2020, the first country to make such a promise. He also made great strides at attempting to convince industrialized nations to take charge of the situation, but was not successful. Today, unfortunately, political uncertainty threatens progress in the Maldives as President Nasheed was ousted from office. The Hydrous aims to provide essential insights and visualizations of coral reefs to local resource managers, and to use visualizations to encourage the government to increase enforcement and protection of their marine protected areas. Coral reefs are an essential buffer against storm damage and weather events, and their protection can help counter the rapid erosion of shorelines. By assisting research and providing visualizations of this ecological last stand we hope to focus the political conversation on curbing global carbon emissions, and the importance of coral reefs in countering its effects. Of course, getting to this remote island nation is the first challenge. A 35-hour travel day deposited Hydrous founder Sly Lee in Male, the capital of the Maldives. A seaplane from Male to Kuredo, and a speedboat from Kuredo to Vavvaru finally led to the arrival at the Korallian Lab, a new lab dedicated to undertaking and sustaining world-leading marine research. The Hydrous is collaborating with local expert scientist Dr. Michael Sweet of the University of Derby, and will begin investigating coral reef resilience and fish habitat preferences- research which is made more important by the impending El Niño. Taking a seaplane is only one step in the multi-day travel to the Korallian Lab on Vavvaru Island. Snorkeling around the island revealed a diverse range of habitats, including shallow forereef, backreef and a dropoff. Initial dives have started on degraded sites, and show both coral degradation and some promising healthy coral. Research will continue over a two-week period to photograph and create 3D models of reefs of inhabited islands and of uninhabited ones. Surveys will include recording fish species, size and abundance, 25 meter benthic photo surveys and 3D coral models. Utilizing both scientific and photographic surveys will provide valuable insights on fish diversity, coral reef biodiversity and topographic complexity. The three-week expedition in the Maldives will provide crucial visual and scientific information, and will establish a benchmark view of coral health before the El Niño event, which is anticipated to occur in January 2015. The 1998 El Niño caused up to 90% bleaching and subsequent death of coral reefs around the Maldives. Potential damage to coral reefs during the El Niño could have great impact on the ecology of these marine habitats, the political conversation of climate change, and most importantly, on the lives of people living on this island nation. A glimpse into the beautiful corals of the Maldives and the people who protect them. Pearl Harbor is an active harbor rich in history, and steeped in cultural significance. The site of the Japanese attack on the day that will "live in infamy," December 7, 1941, the harbor is known for its role in involving the United States in World War II. The harbor is also the site of several sunken battleships from the attack, including the USS Utah and USS Arizona, the latter which is open to the public and whose gun turrets protrude from the water at the memorial. Despite the harbor's rich cultural significance, it is not known for it's biological diversity. The harbor's silty and brackish water prevent significant coral growth, but how much coral lives in the harbor is, as yet, a mystery. Recently The Hydrous, in collaboration with the National Park Service, began some of the first research in the harbor to monitor coral settlement and growth. The team placed the first coral settlement tiles around the park, which will be retrieved, analyzed and replace over the course of a year to monitor coral recruitment, the rate at which various coral species settle on different substrates. 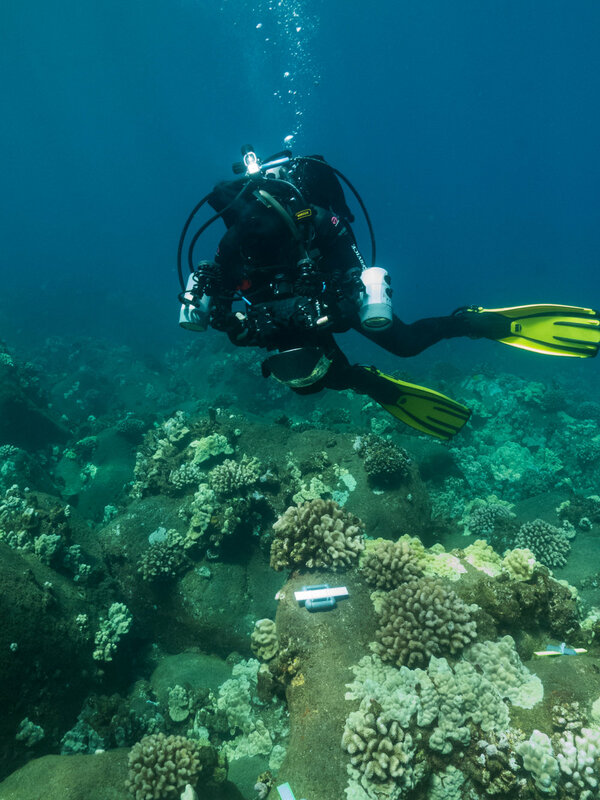 The project began from park divers noticing an unusual amount of corals and sponges growing on the USS Utah and Arizona, prompting questions about coral growth in the park. The amount of coral came as a surprise to divers due to the conditions surrounding the battleships: heavy metals and oil constantly leak from the wreckage, but as yet, do not seem to affect the corals. The results of this research will give scientists an insight into the relationship between the wrecks and the coral in the park, and a glimpse of the future where both are understood and protected. A drop of oil floating at the surface of the water near the USS Arizona Memorial. This week we ramped up our efforts and conducted a project further investigating Autodesk's software, ReCap, and its viability to make high resolution 3D coral models (The more accurate technical term is 3D textured geometry). We are very interested in the novel ability to measure coral surface area. This has the potential to revolutionize coral reef research and outreach. US NPS: Dr. Eric Brown (Marine Ecologist), Randall Watanuki (Boat mechanic), Scott Pawlowski (Chief of Cultural and Natural Resources at VALR) and myself (Marine Science Technician and Science Communicator Specialist) from the KALA US National Park Service. In preparation for this project, we were featured twice in Shaan's blog, www.autodesk.blogs.com! In his posts he highlights some of our models and previous work. The full article can be found here and here. We are very excited about the results, which are soon to come! Check back for more details! This post is dedicated to the ~13 million jellyfish that inhabit Palau's world famous Jellyfish Lake. Watch the video in full screen for maximum euphoria! Ongeim’l Tketau (OTM), also known as Jellyfish Lake, is a 30 m deep basin filled with seawater indirectly connected by cracks and crevices to the lagoon. There are actually two species of jellyfish that live here: the golden jellyfish, Mastigias papua etpisoni, and the less common moon jelly, Aurelia sp. Jellyfish lake's exact number of inhabitants fluctuates quite a bit, and that's why Patrick Colin and his team at the Coral Reef Research Foundation quantitatively monitor the population of these jellyfish each month. These incredible creatures have a symbiotic relationship with microscopic algae, called zooxanthellae, which is also found in many corals. These microscopic animals generate energy through photosynthesis, providing its host jellyfish with energy. In return, the jellyfish gives these zooxanthellae a place to live. Native anemones, Entacmaea medusivora, prey on the golden jellies and can eat jellyfish many times their size. However, in this lake also exists a similar non-native species of anemones that have the ability to displace the native ones, potentially becoming an invasive species. Today while kayaking and snorkeling for more coral models, my friend and CRRF employee, Gerda Ucharm (the ch is silent), spotted an ancient Palauan drawing on one of the rock islands, right next to a construction site. At dusk we went to look for Mandarin fish at Sam's Dive Shop Harbor. Little did we know we'd be in for the best photography dive of my life. 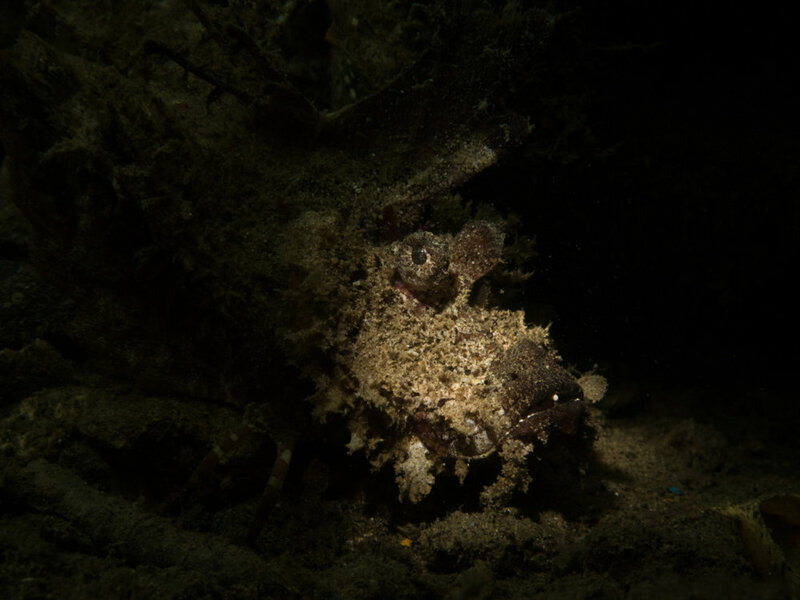 Gerda's eagle eyes spotted a crocodilefish, a devil scorpionfish, a filefish, pipefish galore, and a plethora of Mandarin fish. 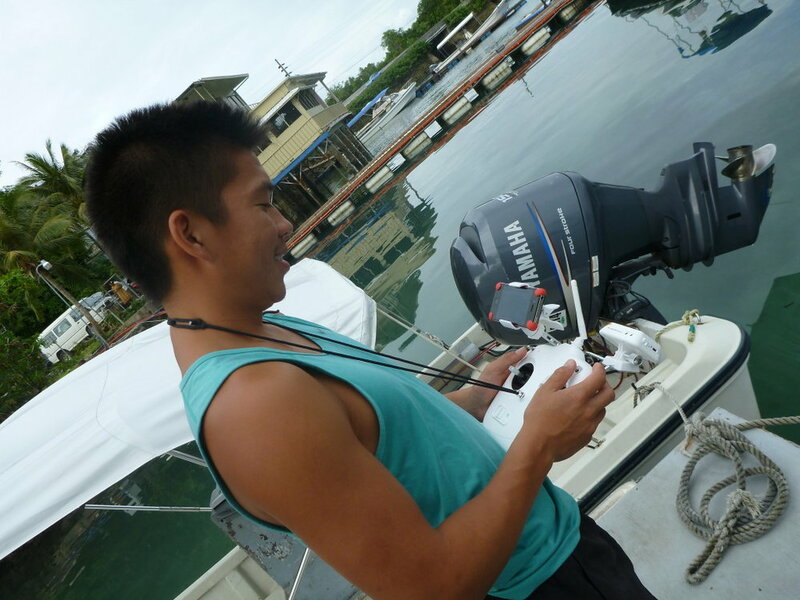 R.I.P to my beloved Phantom 2 Vision Quadcopter, who died in service at the Coral Reef Research Foundation harbor. I will establish the site as a new wreck dive and begin running dive tours next year.